Both my father and grandfather were stamp collectors - philatelists is the technical word - who dabbled in a recreational way with commemoratives from foreign countries. Nearly all were canceled (used) stamps that today, as back in their day, have no real value other than to someone interested in history. Of course none are the rare types. I now possess many of those stamps in an album that was painstakingly hand-illustrated and assembled to arrange each stamp according to its country and issue date. At one time I, too, dabbled in the hobby, having collected many plate blocks and special issue U.S. stamps in the 1970s and 1980s, along with purchasing a few designs of special purpose such as those with aerospace and communications themes. Sad to say, most of those stamps, even those in mint condition, are valued at the denomination printed on the face - meaning inflation has reduced their worth to even less than when originally purchased. If indeed 'what's past is prologue,' then there is not much incentive for anyone to take up the hobby in any hopes of it doubling as an investment. 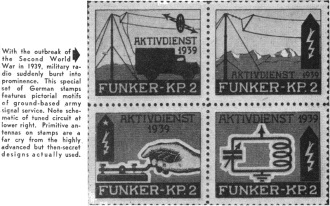 A few years ago I posted a page titled "Radar, Lidar, Amateur Radio, & Radio on Postage Stamps" that is a pretty good roundup of all the stamps I could easily find at the time (until I tired of looking). 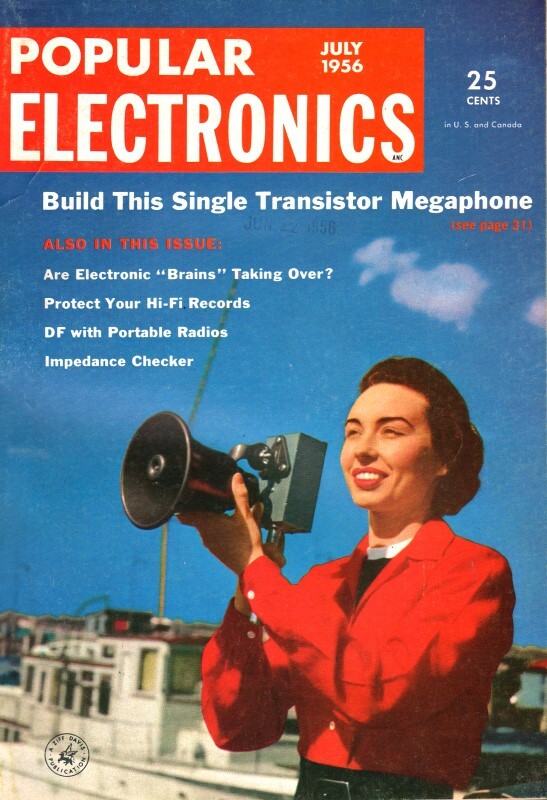 After seeing this article from a 1956 edition of Popular Electronics, I see I missed a lot. 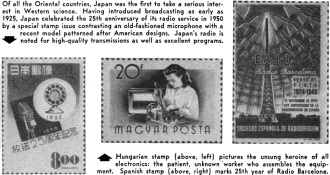 Postal authorities throughout the world have marked the rise of radio in rare stamp issues. Stamp collecting has come a long way from the old-fashioned system of assembling stamps according to country and issue. "Topical collecting," a new trend in this ancient hobby, picks out stamps on a specific theme, such as flowers, horses, medicine, or what have you. Herbert Rosen, whose business is radio and whose hobby is stamps, combines the two in a unique collection of stamps picturing nearly every aspect of electronic communications. Starting with the scientists whose discoveries cleared the way for modern electronics, his collection takes us right through the current spread of TV to various countries of the world. Part of this collection has been published in a book titled Radio Philatelia (reviewed in our April, 1956, issue). Mr. Rosen kindly gave us permission to reproduce some of his rare stamps. First transatlantic radio signal, broadcast from Cornwall, was received by Marconi at this tower overlooking the Newfoundland coast. Now a historic landmark, the tower was pictured in this memorial stamp issued in 1928. Spanning ocean by "wireless" gave rise to marine radio, ending ages of dreaded isolation for ships at sea. The hundredth anniversary of electric communications in Turkey, from the first use of wire telegraphy (1855) to modern radio, is celebrated in this 1955 stamp (left, below). The French stamp at its right illustrates early military radio, showing the antenna of the desert fort Sebha in the African colonies. Paris rooftops sprouted antennas when TV came to France. The Eiffel Tower, like the Empire State Building in New York, makes and ideal antenna mast for the city and its surroundings. With more than 800 lines, French TV boasts the world's best picture quality. 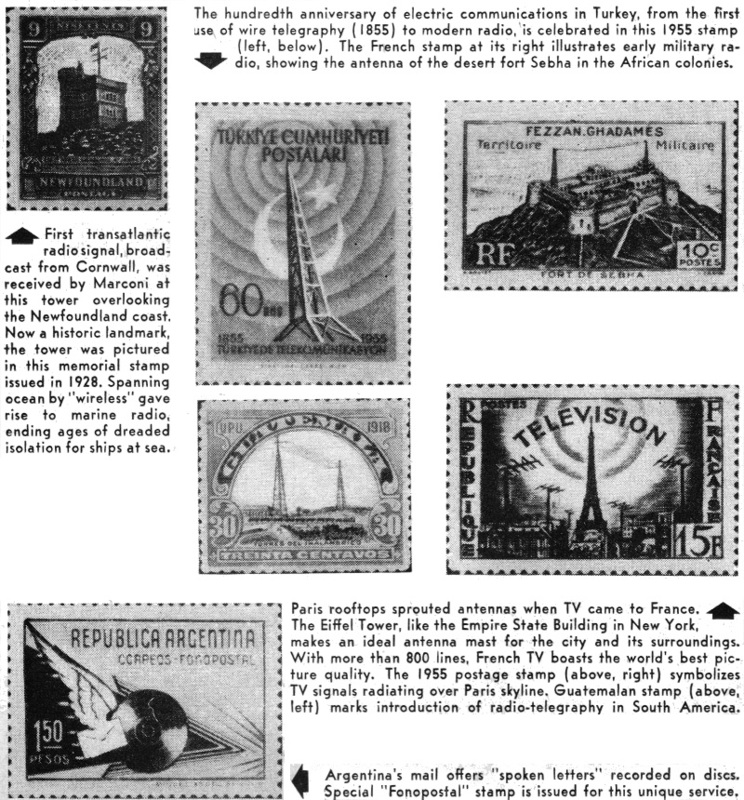 The 1955 postage stamp (above, right) symbolizes TV signals radiating over Paris skyline. Guatemalan stamp (above, left) marks introduction of radio-telegraphy in South America. Argentina's mail offers "spoken letters" recorded on discs. Special "Fonopostal" stamp is issued for this unique service. With the outbreak of the Second World War in 1939, military radio suddenly burst into prominence. This special set of German stamps features pictorial motifs of ground-based ,army signal service. Note schematic of tuned circuit at lower right. 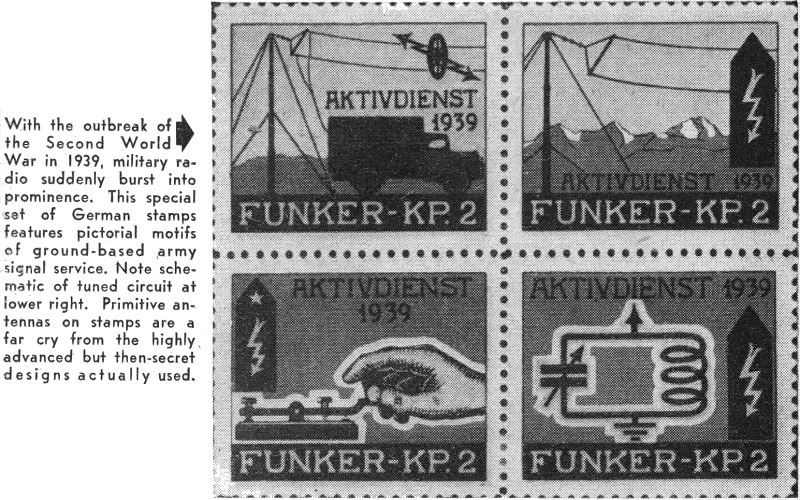 Primitive antennas on stamps are a far cry from the highly, advanced but then-secret designs actually used. Of all the Oriental countries, Japan was the first to take a serious interest in Western science. 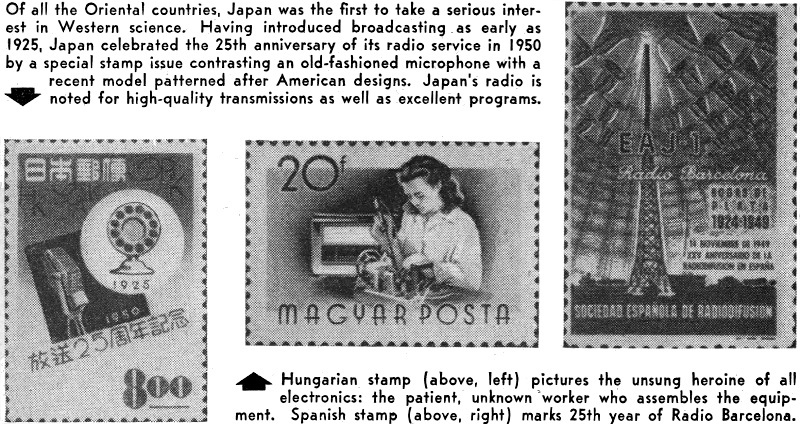 Having introduced broadcasting as early as 1925, Japan celebrated the 25th anniversary of its radio service in 1950 by a special stamp issue contrasting an old-fashioned microphone with a recent model patterned after American designs. Japan's radio is noted for high-quality transmissions as well as excellent programs. Hungarian stamp (above, left) pictures the unsung heroine of all electronics: the patient, unknown worker who assembles the equipment. Spanish stamp (above, right) marks 25th year of Radio Barcelona. Italians took to television (right) with typical gusto when their network finally reached all the main regions. Transmitters were designed with special radiation patterns to jibe with heavy population areas. Stamp at far right shows Monaco, whose powerful radio station perches atop a mountain overlooking Monte Carlo and the sea. One of Europe's few commercial stations, it can be heard throughout the Mediterranean area and recently formed the hub of broadcasting activities connected with the wedding of Grace Kelly and the Prince of Monaco. TV service has now been added.